The Church traces its origins to the twelfth century and in the South wall are five carved zigzag stones considered to be of Norman origin (1066 - 1154). In 1825 the lean-to North aisle was removed and the chancel arch cut away. 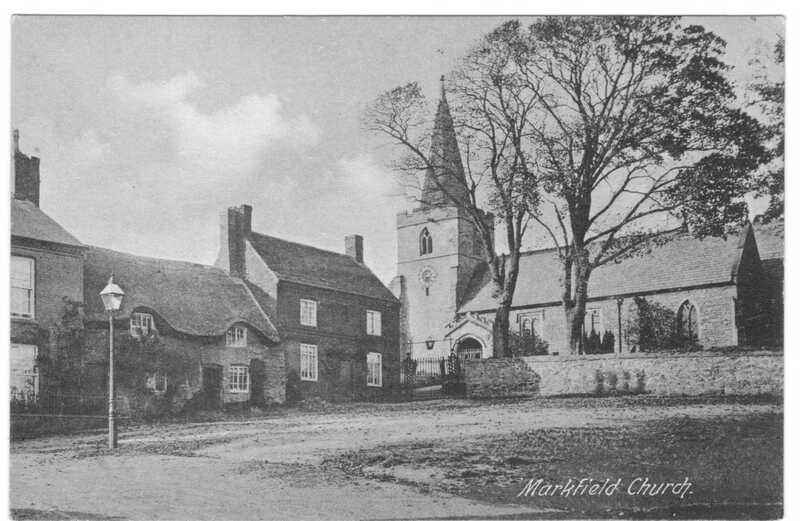 However by 1865 the church was said to be in a ruinous state and was rebuilt with the chancel, vestries and north aisle added. The organ dates from 1906 and the names of those who served in the First World War are inscribed on its panelling. Those who died are noted by a red cross. The bells date from 1617, 1749, 1901-03 (three) and a sixth bell added after the Second World War in thanksgiving for victory. The introduction of electricity marked the sacrifice of lives. Rectors were appointed by the Hastings family (the Earls of Huntingdon) for many years, the last occasion being the Rev AS Butler in 1860. He presided over the 1865 restoration, the building of the National (Church) School on The Green in 1861 and the opening of the Mission Church in Shaw Lane. The next rector was the Rev H Chambers, who was presented to the Living by Aldermann Tidd, Mayor of Loughborough and his father in law - see the image of the 1909 new year card further down the page. In the 1930s, the Matryrs Memorial and the Church of England Trust acquired the right to present the rector. 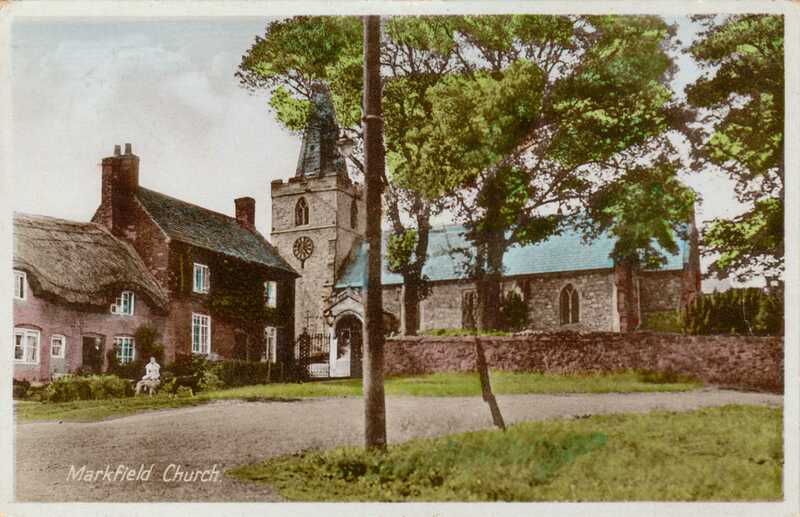 There were many notable events concerning the rectors over the years - as far back as 1282 William de Boudon was fined for poaching; William Purefoy was evicted from the rectory during the civil war (1642 - 1651); and Edward Ellis who opened the rectory to John Wesley on his first visit to Leicestershire (his preaching in Markfield on 13 visits between 1741 and 1779 is recorded on a plaque near the entrance). Those buried inside the church include John Hood who provided the site for Bardon Chapel in 1693; and George Herine who died in 1718 and is said to have been the son of the King of the Gypsies. 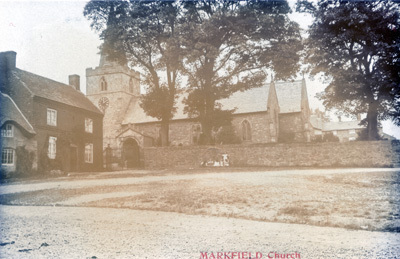 The cast iron gates leading from the East of the Church onto The Green date from 1826. The clock came from Oadby and was hauled all the way from Bardon Hill Station, by horse, in 1900. In 2014, a new war memorial to the fallen of the First and Second World Wars was established in front of the Church. 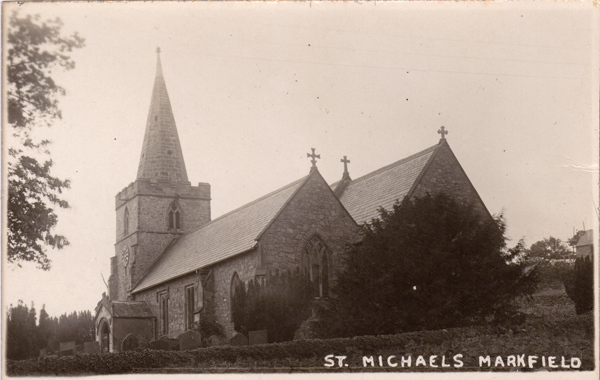 The picture below dates from the early 1900s. Note the group of children in front of the wall ! This picture is probably slightly later. This next picture is taken from further up The Green. 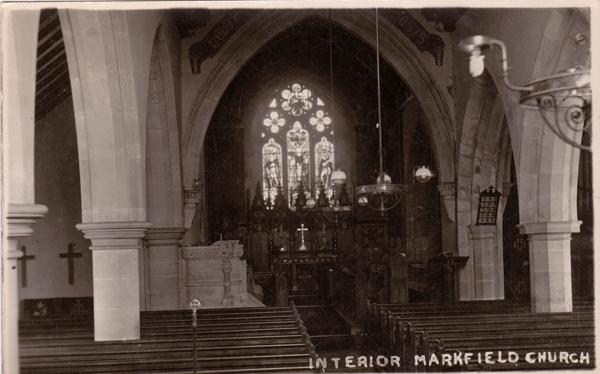 This next picture is of the inside of the Church, in the first half of the twentieth century. 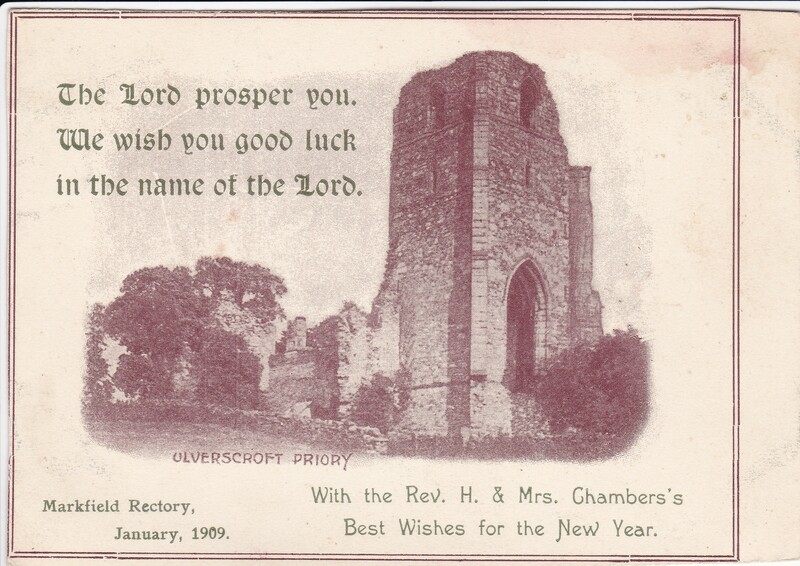 This is an interesting New Year card from the Markfield Rectory in 1909.